Fishing in Vermont has officially started! Fishing resorts in Vermont are not hard to find, but ours is a little unique. At Sterling Ridge Log Cabins we are lucky to have 2 ponds where you can fish your days away, no license required (as long as you are onsite!) One of the ponds is a small, trout pond and another larger, 14-acre pond that seems to have a plentiful supply of bass! Fishing in Vermont has begun throughout the state. Fishing options in our area include the Lamoille River or Brewster River – what better way than harvesting a fresh trout and grilling it over charcoal while enjoying a nice Vermont night. Of course, as many of you know, at Sterling Ridge Log Cabins we recommend “catch and release” angling on our ponds. Off property, whether you catch or catch and release is up to you and the guidelines of the Vermont Fish and Wildlife. If you would like to venture off our property to fish in Vermont, fishing licenses are required. Fishing in Vermont is easy; all you need is a license which can be purchased online (prior to your arrival) or at the local fishing outfitters, such as Green Mountain Troutfitters located in Jeffersonville, Vermont. GMT specializes in fly fishing, but will not turn you away if you are interested in a traditional rod and reel. 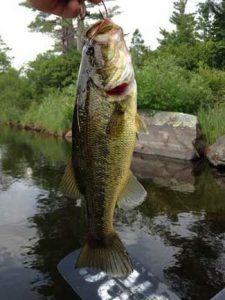 The Vermont Fish & Wildlife website has everything an angler would like to know about fishing in Vermont. Now get out there, go for it and don’t forget to invite us to your cabin for a fish fry! For more information on fishing in Vermont and the Jeffersonville area, be sure to check out Green Mountain Troutfitters on RT 108 S. in Jeffersonville or visit their website at: www.gmtrout.com or visit Vermont Fish & Wildlife at www.vtfishandwildlife.com or take a guided fishing trip with Bass Fish Vermont – Dogs welcome!